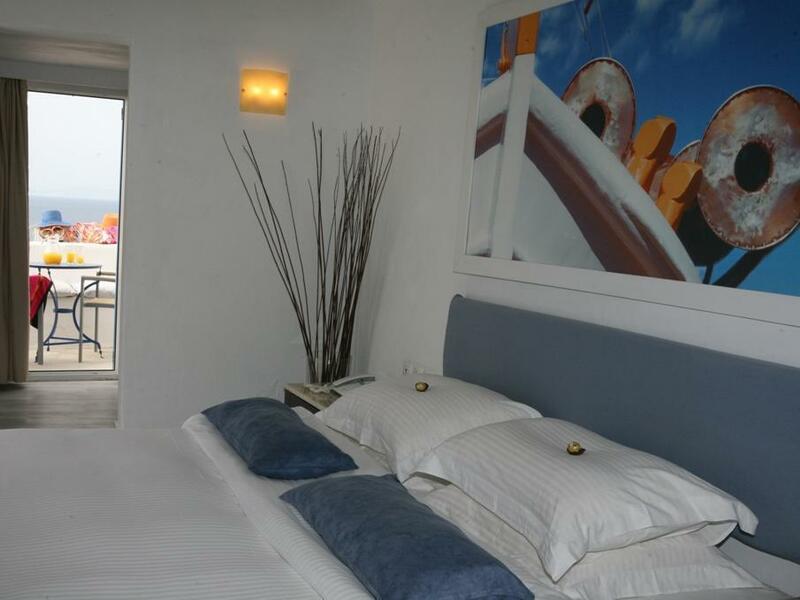 ﻿ Madalena Hotel Mykonos. JIMAT di Agoda.com! Ada soalan mengenai Madalena Hotel? Terletak di kawasan yang indah di Bandar Mykonos, Madalena Hotel menikmati posisi megah di hab siar-siar, romantik, pantai di tengah-tengah Mykonos. Terletak 0km dari keseronokan bandar, hotel 3-bintang ini terletak di lokasi yang sangat baik dan menyediakan akses kepada tarikan terbesar di bandar. Pelawat yang datang ke hotel boleh melawat tarikan utama di bandar ini seperti: Minima Gallery, Evelin Gallery, Muzium Maritim Aegean. Di Madalena Hotel, perkhidmatan yang cemerlang dan kemudahan yang unggul menjadikan penginapan anda tidak dapat dilupakan. Semasa menginap di penginapan yang indah ini, tetamu boleh menikmati Wi-Fi percuma semua bilik, Wi-Fi di tempat awam, khidmat bilik, pengangkutan lapangan terbang, bilik keluarga. Alami bilik dengan kemudahan berkualiti tinggi sepanjang anda menginap di sini. Sebahagian bilik menyediakan televisyen skrin rata, telefon di bilik mandi, kopi segera percuma, teh percuma, minuman alu-aluan percuma untuk memudahkan tetamu berehat dan kembali bertenaga. Kolam renang terbuka di hotel merupakan tempat yang ideal untuk anda relaks dan tenangkan diri selepas hari yang sibuk. Apa juga tujuan lawatan, Madalena Hotel merupakan pilihan yang terbaik bagi penginapan anda di Mykonos. Pemindahan lapangan terbang / pelabuhan percuma semasa ketibaan dan berlepas disediakan. Para tetamu diminta untuk memaklumkan kepada pihak hotel anggaran waktu ketibaan mereka. Excellent. I won't recommend for family with child or old parents. 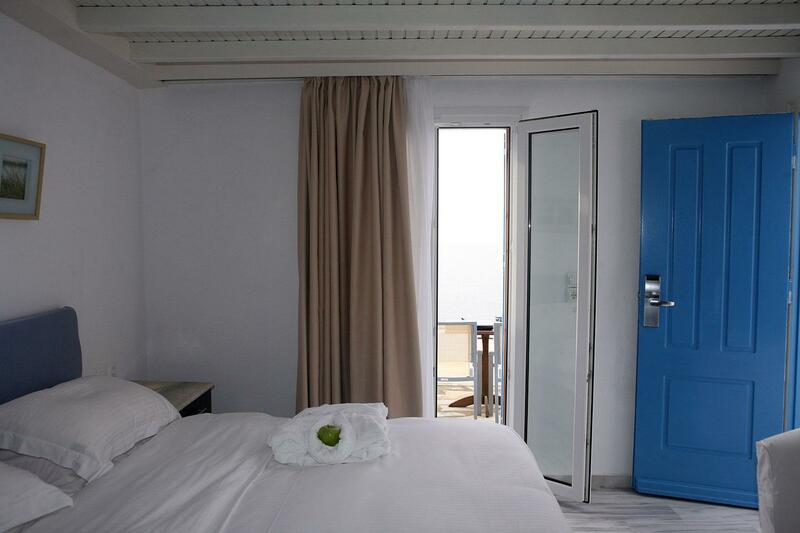 Location for this hotel is near to the Mykonos City. However, walking back from the city to the hotel is all uphil walk. It is tiring and I would recommend you to rent an atv if you are not keen in climbing. The pool is very small but I didn't use the pool. I would rather travel out to the nearby beach for a swim. 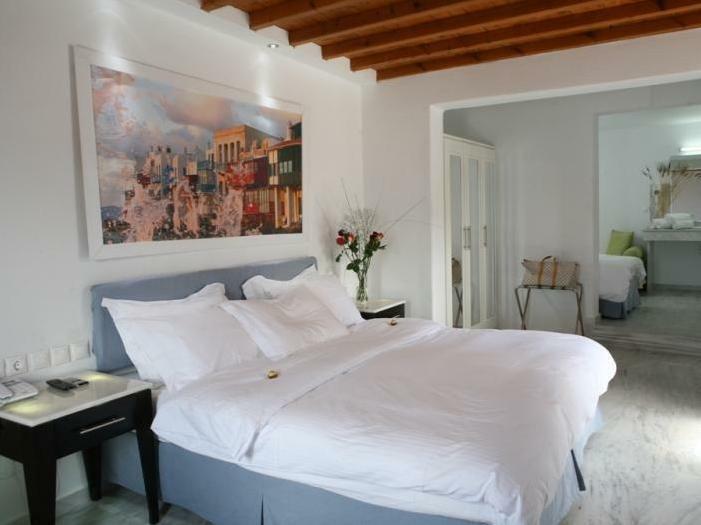 Room is well-designed in Greek Architecture. White paint with Blue window. Nice! Most important, this hotel provides free pick-up from the port and hotel. My room was 122 and had beautiful views. Loved this place. Vicky was awesome providing us with all of the information we need. I loved that they provide free transfers from the port/airport. My room was huge and the shower, OMG you will love it, the only thing is that you will not have privacy, its glass door and you can see and hear everything. The breakfast was excellent, but you cannot eat in your room or take food from the breakfast buffet to your room. Also, if you have a difficult time with steps, do not stay in room 122 because you will have to go u 63 steps to get to your room, but oh my god, if you can, you should. The views are to die for. Also, dont forget to go to: Super Paradise Beach, Paradise Beach and Psearou. Vicky and the other guy (don't know how to spell his Greek name...) so helpful and made me felt like staying home :D The hotel has a very good view of the Old Port, and location is perfect, walking distance to town Nd bus stop that take me to Paradise Beach! For sure if coming back Mykonos, this hotel will be my first priority! Receptionist is very welcoming and perfect for new visitors. They give you a quick run-down of the cool places to go and what to do while in Mykonos. The amenities are excellent and the location is a short walk from town. The views from the hotel are also gorgeous if you stay in the upper rooms. Would love to come back! The hotel is up the hill from the town, but that is why you have the fabulous views. Close enough to walk to and stroll back from. Staff friendly. Airport transport provided on request. Ticked all the boxes for us & more. Very satisfied. Beautiful spot in Mykonos! Short walk to Mykonos town. Ride from the airport but they were really late and I had to call them. Aweosome breakfast and views, quaint updated room. No pool but would stay again! The hotel offers stunning views from most of the rooms and common areas. Sunsets are gorgeous and it feels like the hotel is in the ideal place. We ended up buying bottle of wine with cheese/meat plate and having dinners on the balcony watching sunset. Rooms are not big, but very clean and well equipped. Very comfortable bed, nice shower, small touches like good quality bath accessories, tea/coffee and large bottle of water every day. Breakfast is probably the best we've had in Greece so far (would be even better with freshly squeezed juice, though, not juice from concentrate). Add panorama views from breakfast tables outside and breakfast lasts for hours. Paying for the same experience in a restaurant would be at least 40 euros. Good pool. Service is great - everyone is friendly and very helpful. Shuttle from the ferry is free and easy (and emails were answered within minutes) Close walk to the town and car/bike rentals. Walk back is a bit challenging during the heat time, but still short - hill is couple hundred meters. From the moment I arrived I was made to feel welcome. The views were stunning, the location exceptionally close to town, and the rooms were simple yet pleasant. Going out in Mykonos in the late night early morning was a foreign concept and I came for the first time knowing nothing. The real strength of the hotel is the staff and their "can do attitude" the likes of which I didn't experience anywhere else on my 2 week travel. They helped me understand what to do, where to go, and how best to enjoy all the island offered. Michaelis especially was incredibly accommodating of my random needs and enquiries :) BTW:There is also a shuttle from the airport I wish I had known about and had I realized just how amazing the place was, I would most likely have encouraged my friends to switch from their overpriced spots far outside the city (quite difficult to get around with only 31 taxis on the entire island) to this hotel. I didn't get a room with the sea view. Actually probably the worst room in the entire hotel. It's enclosed in walls and the wifi connection is really really bad in my room. When I asked for a change the staff showed me another room on the ground floor with a depressing low roof. I don't know how it works but if you could tell me there's no sea view room available before booking that would be very helpful. This hotel is located at the end side of the city centre, just a 5-8 minutes walk to the old town, come back to the hotel might take a longer time as the way require a bit uphill climb. Hotel is clean and beautiful, perfectly decorated in all white with blue door and some flowers! The view of old port and sea is fantastic, we spent a whole morning sitting in our balcony enjoying the view. Room we got was a bit small but it has everything we need. Shower has good water pressure and we did not encounter the hot water problem. Breakfast was nice with variety choice, we even served rice during our stay!! As an eastern we were so touched to see oriental fried rice in our breakfast! Michael and the team were friendly and helpful, port transfer can be arranged according to your ferry / flight schedule. Everything was perfect and we wish to return to this hotel one day! The view was amazing. The staff were exceptional, particularly Yelena who was so friendly, polite and helpful. Buffett breakfast was fresh and lovely. We were pleasantly surprised by our stay at Madalena Hotel, a pick up service was offered from our ferry and delivered us to the hotel where we were greeted by Yelena who was very friendly, polite and helpful. We were showed our room and were in awe of the amazing view. The room was spacious with a king bed and I liked the marble floors. It is a short walk down hill to the old city, coming back is fine if you are fit...maybe a slight issue if you are not so fit...but definetly worth it for the views. Overall we were pleasantly surprised and wouldn't hesitate staying here again. Book a room including airport or marina transfers. This hotel is close to town, walk about 15 minutes. This is a very nice hotel, book a room including airport or marina transfers, just write e-mail or call them on it. Rooms can see the sea, in the morning to get up to open the window you can see the blue Aegean Sea and very comfortable. The hotel rooms are comfortable and clean, the balcony can see sea and can watch the sunset, good breakfast, a buffet breakfast can be eaten toward the sea. This hotel is close to town, walk about 15 minutes. The view from balcony is fantastic. Room is big and comfortable. Nice breakfast. It was a great stay. It takes about 10 mins to walk to the town centre. It is fine because you can enjoy the view at the same time! Actually you can go anywhere on foot in Mykonos. The room is big enough and the balcony view is really lovely! Everyday when we woke up, we were amazed by the scene. The down side is that the shower water was not hot and strong enough. Hotel provided free pick up from the airport and transfer to the ferry port. Nice staff. The hotel has the car pick up service from the airport to the hotel, staff is very friendly, room is clean. Location is a not very convenient, if you do not have a car with you, i will not recommend you to stay here, as it's 15 to 20 mins walk to the main street for food and drinks. 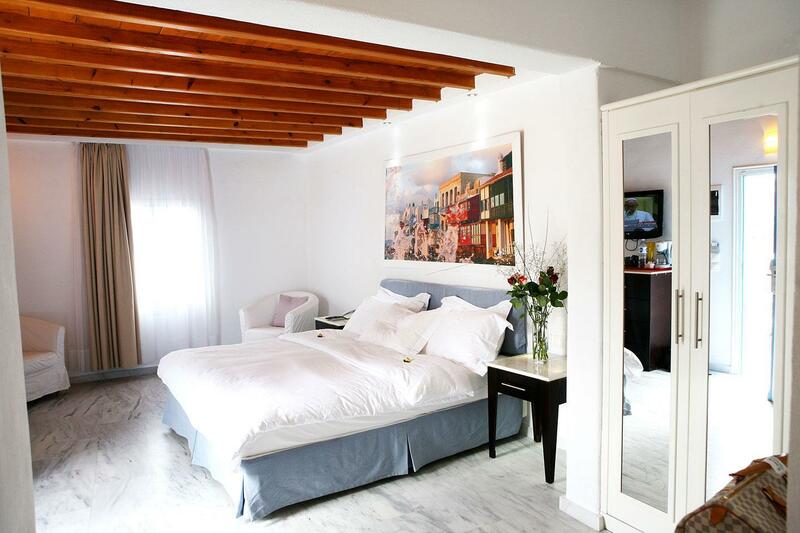 The hotel is very Aegean style, when you stay there, you really feel that you are in Greece.